Are you wearing outfits that represent the you from another time in your life? A time where you were younger or happier than now? Are your clothes telling the world about your psychological state? The answer may be yes! The reality is, you are never going to get younger, and so far, as far as I’m aware, time travel hasn’t been invented yet so we can’t actually go back in time! If you have a bunch of old and dated clothes still hanging in your wardrobe, and you may or may not be wearing them still, I’d like to ask you why? So often I meet women who tell me that they have a wardrobe stuffed full of clothes but still nothing to wear. Holding onto the old stuff can be one of the reasons and it’s really not helping them in their current life. Very often, in my experience of doing many wardrobe therapy sessions, is that these clothes speak about a time in our life, maybe it was a happier time? Maybe we were younger, slimmer or we felt that the style of those clothes, at that time, suited us really well, and we find it hard now to find clothes in the current fashion that we feel as comfortable in. Maybe we’ve been brought up to never throw anything out that ‘still has good wear left in it’. There are so many reasons that you may come up with for hanging onto the past. 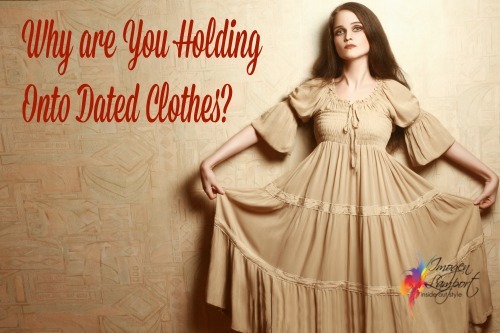 If you are holding onto clothes that are dated, particularly if you’re not wearing them, think about the reason they are still in your wardrobe. Do they bring back good memories? 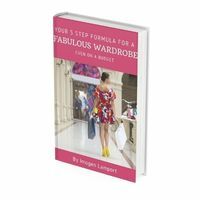 Well you know you can release the item (and make some space in your wardrobe) without losing or forgetting the memory. Does it remind you of a time when you were slimmer? Maybe your plan is to get back there? 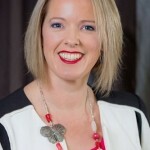 Problem with keeping the garment is that it’s out of fashion (and remember clothes are like milk, they go off over time), so it’s a good idea to get rid of the garment because having reminders of weight gained often has a negative psychological effect and doesn’t help you lose that weight. Plus if you gain back that figure, you’ll want to celebrate with some new duds! Is it something that made you feel young and free? Is it still age appropriate? And please don’t age yourself forward for fear of looking ‘try hard’ or ‘too young’ either. If it is something that shows lots of skin, maybe it’s time to let it go. Or if it’s a style that is worn by younger girls (kind of like the dress in the picture above), then I’d say it’s time to relinquish the garment. Have you no idea about fashion and can’t even tell if it’s still fashionable or not? Then why not take a stroll round your local mall and pop into a major department store, or some of the not really young stores (you know the ones where you’re assaulted by the music, they are probably not for you), but also not the ‘old lady stores’ and see if you can see items similar in fabric, pattern and style to what you already have. If you can’t buy anything like it anymore, it’s probably dated. Maybe you’re not wearing it anymore. Maybe it’s no longer your style but was once a favourite. That’s OK, we all change and grow and our styles evolve over time. Or you bought it and it was expensive, so you feel you shouldn’t get rid of it as it feels like you’re throwing away lots of money. Honestly, space in your wardrobe is expensive and for most people there is never enough space, so keeping all those pieces that no longer work for you will free up some very valuable space. Why should you care about wearing dated clothes? Well in general it dates you and can make you look much less youthful than you are. Sadly these days there is a real passion for youth, and many companies when they are making retrenchments, will choose to let go of the people they feel have little ability to change (and yes we can get a bit stuck in our ways as we age), so looking current helps them to see that you may have years on your side, but you also move with the times and can deal with change in a positive way.